If the Federal Reserve raises interest rates at its meeting this month, Bank of America's stock could continue its climb. It's hard to imagine that Bank of America's (NYSE:BAC) stock could climb even higher from here, seeing as it rose 28% in November, but there's one thing in particular that could further fuel its rally: higher interest rates. Analysts and investors are becoming increasingly confident that the Federal Reserve will increase rates at its meeting this month. 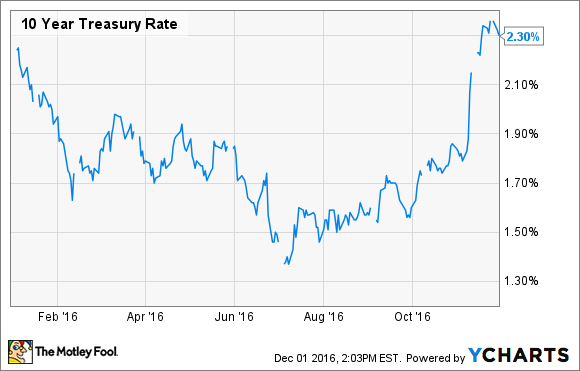 You can get a sense for this by looking at the yield on 10-year Treasury bonds, which rose sharply in the wake of the presidential election, as investors sought to get out in front of a rate hike at the Fed's next meeting. Fed Chairwoman Janet Yellen told Congress in November that the central bank could raise rates "relatively soon" if the economy continued to improve, which has in fact been the case. The unemployment rate is at 4.9%, below the Fed's 5% target. Inflation is picking up, coming in at 1.6% in the latest reading. And home prices on a nationwide basis have now eclipsed their pre-financial crisis high. In light of these trends, members of the Fed have ratcheted up their support for a rate hike in the near future. At the end of November, Fed Governor Jerome Powell said that "the case for an increase in the federal funds rate has clearly strengthened since our previous meeting." Powell's comments were seconded by Dallas Fed President Robert Kaplan, who was in favor of interest rate increases at the central bank's two latest meetings -- in September and November. "My view has not changed," Kaplan told CNBC this week. "I believe we are at the point where we ought to be removing some amount of accommodation in the near future." Oil prices are another variable that could play into this, as the cost of energy exerts an influence on inflation. You'd be excused for thinking, in fact, that low oil and natural gas prices are a primary reason that inflation has consistently come in below the Fed's 2% target despite the other improvements in the economy. This could soon be about to change, however. It was reported earlier this week that Russia, Iran, and OPEC have come to an agreement to cut oil production in an effort to boost prices. If this works and is inflationary, then it could remove one of the last impediments to higher rates, freeing the Fed to boost them later this month. Once the central bank pulls the trigger, Bank of America will make a lot more money. According to the North Carolina-based bank, it will generate an added $5.3 billion in annual net interest income if rates rise by a mere 100 basis points, or 1 percentage point. That's a lot of money, much of which would fall unimpeded to the bottom line, when you consider that Bank of America currently earns only $5 billion a quarter in net income. Thus, while it's tempting to assume that Bank of America's stock couldn't possibly go much higher from here, a decision by the Fed at its upcoming meeting to raise interest rates would prove that assumption wrong.